Well, well, well....where do I start on this film? I’ve got very few complaints about the book, but the film version represents the best and the very worst of the film series. It comes out pretty good in the end, but there are some huge, glaring flaws. I am a die hard fan of the books (I’ve read each one a couple dozen times), and the film being inaccurate in many parts is not my major complaint; on the contrary, I like it when films stray from their book counterparts. If they didn’t, film adaptations of books would be very boring. The adaptation in the film version is good, very good, but is ruined countless times by bad editing, lazy directing, and more bad editing. 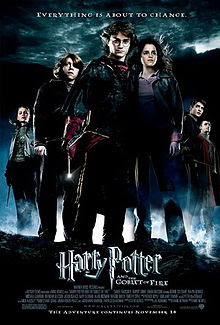 For those of you who don’t know, Harry Potter and the Goblet of Fire tells the story of Harry’s fourth year at Hogwarts...and what a year it is. The school is holding the Triwizard Tournament with two other schools. The tournament tests three champions (one from each school) in a series of grueling physical exams that test them on bravery, determination, and magical skill. But Harry’s name comes out of the mysterious goblet of fire as well, and now he must compete in the dangerous tournament. At the same time, dark things are happening that point to the inevitability of Lord Voldemort’s return, and these two plots are unmistakably linked, and in the end, one and the same. Goblet of Fire, of all the books, probably has the most straightforward plot. There are, as always, lots of subplots, but the book focuses mainly on the tournament and the ominous signs of Lord Voldemort’s return. The film abandons all subplots and focuses only on these main plots. This is a very good choice. How the film handles its material is a different issue. Mostly, the film is lots of fun from beginning to end, and handles the majority of its scenes with appropriate levels of darkness and action. The tone is close to the book, though comes nowhere near as close as Alfonso Cuarón’s interpretation, as seen in the third film. Mike Newell lazily directs, and while most of the acting is okay, some acting suffers from the lazy direction. I always suspected that Emma Watson (Hermione Granger) wasn’t a very good actress, and that her acting in the first 3 films was due to good editing and directing. How right I was. Without an excellent director helming, she overacts like crazy, and is just annoying to watch. She’s nothing like Hermione in the slightest, and the film suffers accordingly. Michael Gambon, Richard Harris’ replacement as Dumbledore does a competent job, but is rather irksome in some scenes. He was excellent in Prisoner of Azkaban, but under Newell’s direction, overacts in some scenes, and seems to enjoy manhandling Harry. He grabs Harry and shoves him on three separate occasions in the film, something that felt awkward and tacked on; it was most certainly a directorial decision, and it’s weird. I don’t remember Dumbledore ever physically abusing Harry in the books. But the film’s main problem comes from the edit job. I always knew what was going on, but that’s because I’ve read the book. The first twenty minutes of the film will leave anyone who is only following the film series completely lost. It’s choppy, quick, and leaves out all explanations of what is going on. Obviously, the opening was put together from lots and lots of footage, and all the stuff that explains what the heck is going on was lost in the mix. The next hour and a half go by pretty smoothly, with a few very well done montages, and plenty of scenes that flesh out the story. But when the film hits the third task of the Triwizard tournament, the editing falls apart, and has a tough time getting back on track. See, in the book, the third task is the climax of the story (or so we are meant to think). There’s tons of buildup, and when Harry enters the maze, we’re on the edge of our seats. In the film, it cuts from Snape threatening Harry with a truth potion to the third task. That’s it. No buildup, at all. It just starts, out of the blue. I remember having to explain what was going on to my Mom when she saw this. She hadn’t read the book, and didn’t have a clue what was going on. I remember many other people felt this way as well. I think its obvious buildup footage was shot, but was all cut. That’s the film’s main problem; all scenes developing character, building up tension, expanding on the complex plot were cut. Some remnants of this type of footage remain, primarily in the first half, where the film builds up tension and develops character very well. In fact, the film’s first half, after the characters get to Hogwarts, flows very, very smoothly. The second half is incredibly rushed, with bad pacing and an overall episodic feeling. The last half just reeks of sloppiness, until we reach the scene where Lord Voldemort returns. Now, let me restate that films changing little things from the books do not bother me. However, Voldemort’s return scene shows that if you follow the book, everything will be better. This is the best scene in the film, and one of the best in the series, and guess what? Every line, action, and development in this scene is pulled straight from the book. There’s lots of tension, lots of action, and when Harry is transported back to Hogwarts, you are as breathless as he is. The next scene catches the ball and keeps it rolling. The chaos unfolds in the crowd as Harry returns with a dead body, and you can feel the fear and panic in the audience. Mad-Eye Moody whisks him away, and the next scene also keeps the ball going. There’s mystery and awe as we learn Mad-Eye isn’t Mad Eye at all, but an imposter who set the whole thing up. But when Dumbledore and the gang arrive to save Harry, the ball is fumbled. Not dropped, but the scene is choppy and rushed, and we’re not given a satisfactory explanation as to what all has transpired. The rest of the film is excellent. Cedric’s funeral and the last day of school are great scenes, and the film ends the way the book does; on a happy note, despite the rebirth of evil. Overall, it’s a passable film, but it will be mediocre unless you’ve read the book. It’s not really a coherent film as much as a selection of favorite moments from the book. As such, the films tone is different from the rest of the series. The first three films were all very easy to follow if you’d never read the books, and even if you have, you can tell the difference in film four. Another huge complaint of mine is that Sirius Black is hardly in it. You hear his voice twice, and one of those times, it’s accompanied by a CGI face that blatantly contradicts the book. This wouldn’t be a huge problem, but the third film was all about this character, and in the fourth film, he’s hardly in it. It doesn’t make any sense. The film does, however, have some outstanding elements. Brendan Gleeson’s portrayal of Mad-Eye Moody is superb, and captures the essence of the character perfectly. Ralph Fiennes is exemplary as Voldemort; you really believe this guy is the most evil person who ever lived. And finally, the music is brilliant. John Williams did not return to score, but you don’t notice it. Patrick Doyle’s score is almost as good as William’s, and enhances every scene. The set design is once again beautiful, especially in the Yule Ball scene and the first two tasks. So, overall, it’s the series’ worst entry, but not a horrible film. It’s a fun watch, but read the book first.